Valentine's Day is just around the corner. What are you making for your sweetheart? 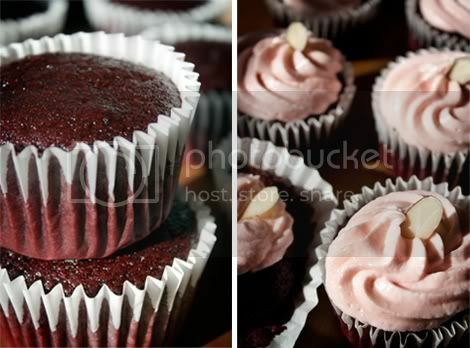 This morning I whipped up a practice batch of Deep Red Velvet Cupcakes with Almond Buttercream Frosting. They turned out fabulous — so moist and delicious. I used Dutch-process cocoa powder in this recipe to give them a hint of deeper flavor (and color) but regular cocoa powder would work just as well. You can also omit the almond flavor, or use just a drop in the frosting if you're not a fan. To start: Preheat the oven to 350°F and line muffin tins with cupcake liners. Whisk the almond milk and vinegar together in a small bowl and set aside (it will curdle). Prepare the batter: Sift the flour, sugar, cocoa, baking powder, baking soda, salt and espresso powder into a large bowl and mix until blended. Grab the bowl containing your curdled almond milk and add the oil, food coloring, vanilla extract and almond extract to it. Whisk well to combine all of the ingredients. Fold the almond milk mixture into the dry ingredients, until large lumps disappear. Bake the cupcakes: Fill cupcake liners with about 1/4 cup of batter each. Bake for 18-20 minutes or until a toothpick inserted into the center of one of the cupcakes comes out clean. Let cool for a few minutes and transfer to a counter or cooling rack to cool completely. In the meantime, make the frosting: Beat the shortening and Earth Balance butter together with a hand mixer until well combined and fluffy. Add the powdered sugar and beat for about 3 more minutes. Add the vanilla, almond extract, almond milk and red food coloring, and beat for another 5 to 7 minutes until fluffy. Using a pastry bag (or a plastic sandwich bag with one corner cut off) fitted with a star tip, pipe frosting onto cupcakes — you should have just enough for 12 cupcakes if you're piping, and if you require extra, the frosting recipe doubles perfectly. 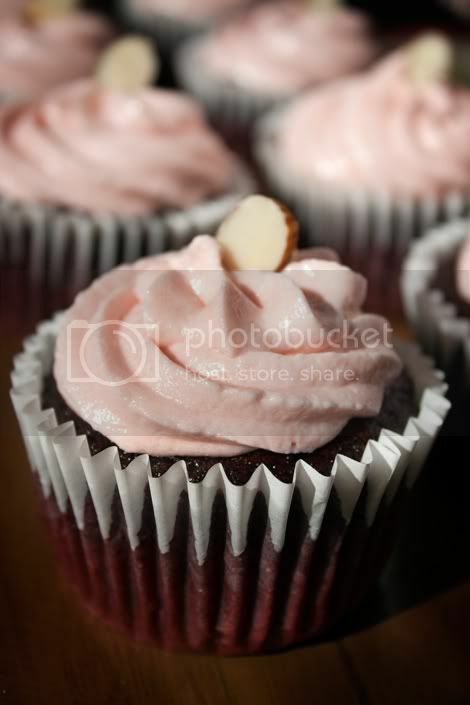 Garnish each cupcake with an almond sliver.